Did you know November is NATIONAL CAREER DEVELOPMENT MONTH? There's no way you wouldn't around our high school. 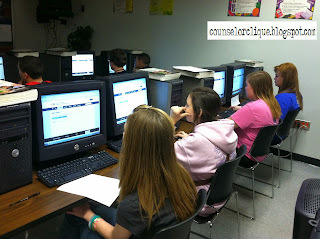 I am a huge advocate of career education and career preparation for high school students. (Check out the National Career Development Association if you're looking for more info.) I am currently finishing up my certification to be Career Development Facilitator certified. Now, for the practical details... In South Carolina, we have 16 career clusters that students can find jobs classified under. This year, my team and I came up with a schedule to get all of our students through a grade-level based career assessment. Once teachers and administrators were on board, we powered through 2 weeks of career assessments via SCOIS. We used Sign Up Genius to allow teachers the flexibility of signing up for their own time slot. Each grade level had a different assessment to do. Teachers brought their class to a computer lab, and a counselor ran the entire lesson. These assessment results were recorded in a grade-specific Google Survey to be revisited at registration and Individualized Graduation Plan meetings in the spring (individual meetings for each student with a parent and a counselor to discuss future plans and register for next year's classes). Overall, 1094 students took a career assessment and many more are taking make up assessments on their own if they missed their time slot. Students, parents, and teachers can find a wealth of information out there regarding future careers. All it takes is a little familiarity of the resources and some motivation from the counselors!